Chairman Koo made the remarks while delivering his New Year’s message at a ceremony to launch the 2019 business year he presided over for the first time since he took office. He mentioned the word “customer” on 30 occasions. It may be construed as his attempt to get his employees to get “back to the basics” the more difficult a situation becomes. Despite his age of 41, Chairman Koo’s aggressive investments and unprecedented moves are attracting keen attention from industry and business circles. In the latest reshuffle of executives, he promoted 134 officials to managing director, the largest-ever promotion. The average age of the promoted managing directors stands at 48. Chairman Koo toured LG Science Park as his first official appearance since he was inaugurated, indicating that LG Group is expected to expand projects in businesses such as AI, IoT and 5G this year. LG Group is accelerating efforts to strengthen LG Group’s presence in the automotive electronics parts business. Last April, LG Electronics acquired the Austrina vehicle head lamp company ZKW for 1.444 trillion won. The electronics company is ramping up collaboration with Hear Technologies of the Netherlands and Hella of the United States. 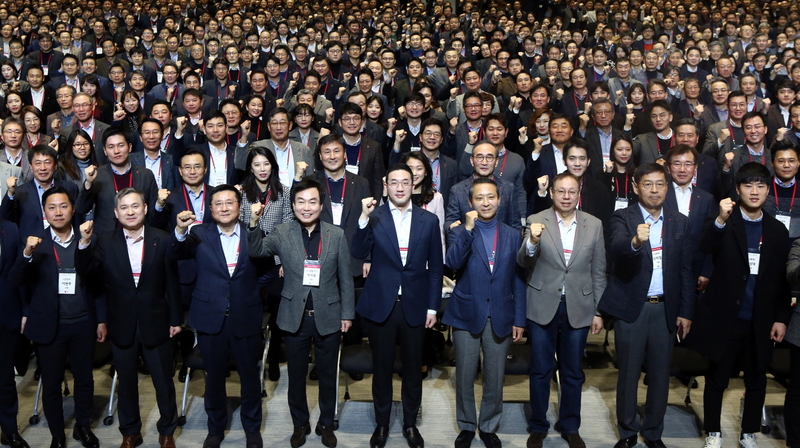 LG Group is expanding its leadership in mainstay businesses such as electronics, chemicals and telecom services, and accelerating efforts to nurture growth engines such as automotive electronics parts, robots, AI, next-generation display panels, and 5G. LG Electronics strives to enhance profitability by making the most of the competitive edge of value-added premium home appliance products such as OLED TVs, while planning to yield full-fledged achievements with differentiated competitiveness in businesses such as automotive parts, AI and robots. The electronics company plans to expand OLED TVs outfitted with its own AI platform “DeepThinkQ and release premium products such as 8K OLED TVs to lead the global TV market next year. LG Display plans to channel about 16 trillion won for two years from this year to secure leadership in the global OLED display market. The move is designed to raise the OLED business’s portion of sales from current 10 percent to 40 percent. The company is now building an OLED plant in Guangzhou, China, while concentrating on investing in plastic OLED segment at the Paju OLED plant in Gyeonggi-do. The demand for the OLED TV panel is forecast to rise to 6.7 million units. The company has a strategy to have a production system enough to cope with new customer demand in consideration of outside variables such as global business trends. LG Chem plans to expand value-added products such as basic materials and batteries as well as overseas product centers to explore overseas markets. The company will concentrate investments to ramp up production capacity of value-added products such as polyolefin, plastic engineering and next-generation super absorbent polymer.